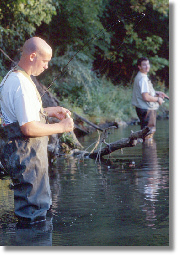 The Olentangy River has a history as a fishing destination. Early in the 1900’s the Olentangy was known to sport fishers as a haven for small mouth bass. Although sport fish populations declined in the middle of the century, small mouth bass and other game fish have become more abundant in recent years. Fly fisherman are gradually becoming a common sight on the river once again. In general, fish on the Olentangy are considered safe for human consumption, but some restrictions and precautions do apply. If you have questions, check the Ohio Sport Fish Consumption Advisory.